Hailed as TV's best new drama by critics everywhere, the award-winning Homeland delivers compelling characters, thrilling twists and breathtaking suspense. Carrie Mathison (Golden Globe winner Claire Danes), a brilliant but volatile CIA agent, suspects that a rescued American POW may not be what he seems. Is Marine Sgt. Nicholas Brody (Damian Lewis) a war hero...or an Al Qaeda sleeper agent plotting a spectacular terrorist attack on U.S.. Homeland makes its triumphant return after winning six Emmy Awards, including Outstanding Lead Actress for Claire Danes, Outstanding Lead Actor for Damian Lewis and Outstanding Drama Series. Marine Sgt. Nicholas Brody (Lewis) is now a U.S. congressman, and former CIA agent Carrie Mathison (Danes) has returned to civilian life. But when a new and potentially devastating terrorist threat emerges, Brody and Carrie's lives become intertwine..
As Carrie (Emmy winner Claire Danes) and Saul (Emmy winner Mandy Patinkin) search for the truth behind the bombing of CIA headquarters, lines are blurred between friend and foe and no one can be trusted. While hiding a stunning secret of her own, Carrie helps recruit Brody (Emmy winner Damian Lewis) for a dangerous mission that could offer him a chance at redemption. But when the plan unravels and Brody is targeted deep inside Iran, he ..
Gripping suspense escalates to a fever pitch in the brilliantly reinvented fourth season of this Emmy Award-winning thriller. In her new role as a CIA station chef, Carrie (Emmy winner Claire Danes) convinces Saul (Emmy winner Mandy Patinkin) and Quinn to help her hunt down one of the world's most dangerous terrorists. But when Carrie recruits a young Pakistani as an asset, the lines between right and wrong are blurred and the operation..
Claire Danes delivers another phenomenal performance as Carrie Mathison in the fifth enthralling season of the acclaimed drama Homeland. Now working at a private security firm in Berlin, Carrie is trying to start a new life, but she soon discovers she can’t escape her past. Blindsided by stunning betrayals, and without Saul (Mandy Patinkin) and Quinn (Rupert Friend) to rely on, Carrie must uncover a deadly conspiracy that puts thousands..
Emmy Award winner Claire Danes gives another riveting performance in Season Six of the Emmy Award Winning Drama Series, Homeland. Now living in New York City, Carrie (Claire Danes) gets swept up in the after effects of the U.S. presidential election as she struggles to deal with an injury-ravaged Peter Quinn (Rupert Friend) and an increasingly suspicious Saul Berenson (Mandy Patinkin). When the president-elect battles the CIA during her..
Emmy Award winner Claire Danes gives another riveting performance in Season Six of Homeland. Now living in New York City. Carrie (Claire Danes) gets swept up in the after effects of the U.S. presidential election as she struggles to deal with an injury-ravaged Peter Quinn (Rupert Friend) and an increasingly suspicious Saul Berenson (Mandy Patinkin). When the president-elect battles the CIA during her transition to power, Carrie finds he.. Season 1 Hailed as TV's best new drama by critics everywhere, the award-winning Homeland delivers compelling characters, thrilling twists and breathtaking suspense. Carrie Mathison (Golden Globe winner Claire Danes), a brilliant but volatile CIA agent, suspects that a rescued American POW may not be what he seems. Is Marine Sgt. Nicholas Brody (Damian Lewis) a war hero...or an Al Qaeda sleeper agent plotting a spectacular terrorist atta.. Homeland The Complete Seasons One And Two..
Watch carefully... all three seasons of this Emmy-winning phenomenon offer something new everytime. 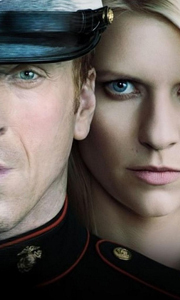 The lives of brilliant but volatile CIA agent Carrie Mathison (Emmy winner Claire Danes) and rescued American POW Nicholas Brody (Emmy winner Damian Lewis) become intertwined in a delicate dance of suspicion, deceit and desire. CIA veteran Saul Berenson (Emmy winner Mandy Patinkin) aids Carries in her quest for the truth, but lines are bl..
Own Homeland Seasons 1 to 4 DVD from Deff, DVD, Blu-Ray & 4K Video Specialists - Free UK Delivery.. This incredible collection contains all five seasons of the acclaimed TV thriller Homeland. Brilliant but volatile CIA agent Carrie Mathison (Claire Danes) risks her life to thwart deadly terrorist plots originating in countries across the globe, from Pakistan to Germany to America itself. On her mission, Carrie’s life becomes intertwined with rescued POW Nicholas Brody (Damian Lewis), CIA veteran Saul Berenson (Mandy Patinkin) and leth..
Own Homeland Season 7 Blu-Ray from Deff, DVD, Blu-Ray & 4K Video Specialists - Free UK Delivery..
Own Homeland Season 7 DVD from Deff, DVD, Blu-Ray & 4K Video Specialists - Free UK Delivery..
Own Homeland Seasons 1 to 3 DVD from Deff, DVD, Blu-Ray & 4K Video Specialists - Free UK Delivery..